Our garlic crop this year is measly, but it's our own fault. We didn't get it planted in time last fall and the ground froze. So we started it in sand inside and while some of the cloves sprouted, some did not. Jamey planted what sprouted in the early spring, but this left us with about a third as much garlic as last year. We're kicking ourselves. But, everyone makes mistakes and I can tell you one thing. We are NOT forgetting to plant garlic this fall. Mistakes can make you clearer minded in the end. About 2/3 of our garlic crop this year. You don't know how hard it is for me to say that. The rest lost their stems and are hanging out in a brown paper bag in the pantry until they're needed. Thankfully, we have about one full braid left from last year that has held up incredibly well, having lived in my kitchen since last summer. I'm thinking I'm still going to need more garlic- think salsa, tomato sauce, etc. If any of you local folks have an abundance of garlic, I'd love to barter. To braid garlic, pull it out of the ground when the stems are half green and half brown. Let them cure outside (keeping them dry) until the stems have just turned all brown, then braid. 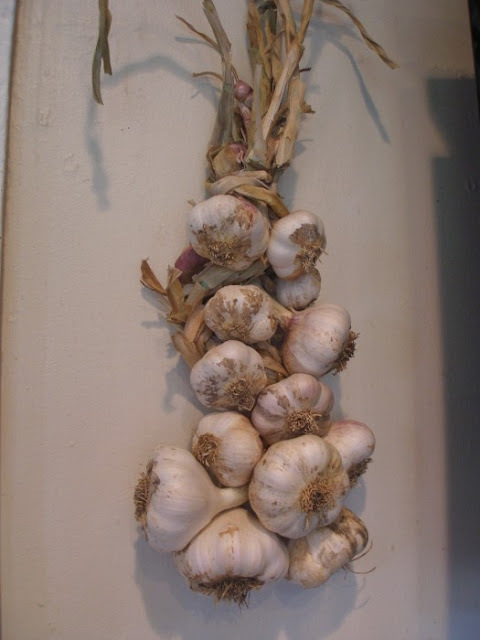 Go here to check out our braiding garlic post from last year. It's my most visited post via google search. May we all be blessed with garlic breath! Not to change the subject but, can anyone guess what this is? I might just try garlic this fall. I have enjoyed my first garden and want more! I didn't braid my garlic. I'm terrified of it spoiling so I pureed the cloves in olive oil and froze the resulting mush. I love scooping into it when I need some instead of peeling a clove! some kind of potato. my sweets have dragon wing looking leaves, but similar to this. My garlic harvest was pretty measly as well. This was my first year growing it though, so I'm hoping for better results next year. We'll both do better. You all are so smart. Yep! They're sweet potato sprouts. 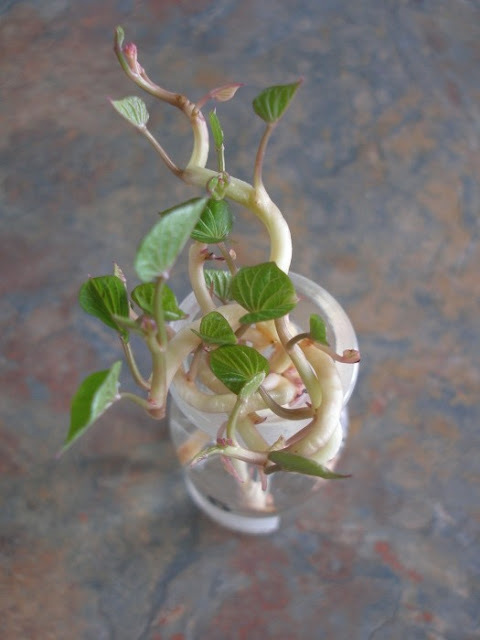 We found the white roots coming off one of our sweet potatoes still stored from last year. Jamey put then in water and they quickly sprouted leaves. If only we had these back in the spring when we were searching high and low for sweet potato slips. Next year, we're going to try to grow all our slips ourselves.